Becoming a part of your local church is not about adding your name to a roster; it's about connecting with the people and the vision of God's church. Located in Central Florida we invite you to attend a few services to see and experience the difference our church can make in your life. Pastor Norm and Dina launched East Coast Believers Church in 2003 with a handful of people and a heart to see those in the Orlando area experience a real relationship with God. Together as a team, they lead East Coast Believers Church passionately to see stories re-written and lives changed by the power of God’s love. The message at East Coast Believers Church is one of hope for the hurting through Jesus. 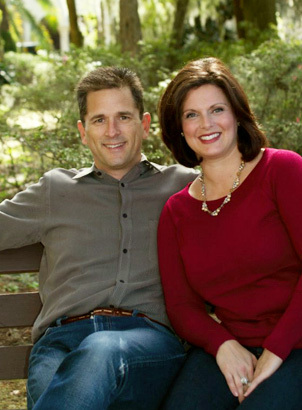 The Dubois’ firmly believe in the truth of God’s Word and are committed to the cause of the local church. Norm and Dina feel blessed to live in the Oviedo area along with their five children. We're thrilled to introduce you to our Church! At East Coast Believers, our doors are open to people from all walks of life, regardless of where they’re at on their spiritual journey. Often, what people notice first about us is our welcoming atmosphere. Our church is full of people who love God, love people, and aim to enjoy life, church and each other. God is exciting and we believe church should be too! At ECBC, we desire to be the kind of church described in the Bible, where there’s relevant teaching, heartfelt worship, sincere friendships, constant prayer, and compassionate care for those in need. Ministry to the whole family is vital, which is why we place importance on every age group. We want to be Christians with a contagious faith that will encourage and influence the entire community, one life at a time. Our messages at ECBC are Bible-based and we worship God passionately from our hearts. Our desire is that you’d grow in your walk with God and encounter him in a life-changing way. So, whether you’re someone who’s just starting to ask questions about God, or a committed Christian who wants to sink their roots of faith even deeper, you can find a home here at East Coast Believers Church. It won't take you long to see that we're a Monday through Sunday church. Small Groups meet throughout the year and there is a place for everyone to connect and grow with the support of the people around them. You will find that there are opportunities to join Small Groups often. No matter what you’ve been through or what questions you may have, one thing remains the same: God's love for you. One way to experience His love is by becoming part of a local church. We have an amazing team of people here who are dedicated to serve you. My wife, Dina, and I have personally committed our lives to the family at ECBC. It would be an honor to have you join us at any of our services as we pursue God and all that He has for us. In the meantime, you’ll find everything you need right here to get connected. You can use this site to check out our ministries, watch one of our past services, find information on our Small Groups, or read about what’s going on around the church. Enjoy, and please contact us if you have any questions. Believers can be Spirit-filled and Spirit-led. “…you will receive power when the Holy spirit comes on you.” - Acts 1:8. We believe the only way possible to live the Christian life is by God’s power within us. Every believer can be filled with the Holy Spirit with the evidence of speaking in a heavenly prayer language, by simply asking. We seek to practice a daily dependence on God’s Spirit to enable us to do what is right. We exist for three reasons: to go reach people far from God, to grow in our relationship with God, and to give our lives to the plan of God. It's that simple. Becoming a part of your local church is not about adding your name to a roster; it's about connecting with the people and the vision of God's church. We invite you to attend several times to see and experience the difference our church can make in your life. If East Coast Believers seems like the church for you, we encourage you to attend GROW, a four session class that takes you from attending to belonging. Learn more about our purpose as a church at East Coast Believers, and how your gifts and calling fit into that purpose, by attending GROW.